Whereas “Deathcrush” was instrumental in crystallizing the essence of the first wave of black metal, Mayhem’s legacy as “innovators” would be cemented with its proper full-length debut. Draped in mystique and legend “De Mysteriis Dom Sathanas” is more famous for the events that surrounded it than the actual music present. Even though half the line-up has been replaced it is the writing of Øystein Aarseth, the gloomy lyrics of the late Per Yngve Øhlin and a star-making performance by Hungarian transplant Attila Csihar that make the record as memorable as it is. It is the debut performance for new skinsman Jan-Axel Blomberg, who would become the band’s creative leader just a few years later. “De Mysteriis Dom Sathanas” is a worthwhile for what it is, and its enduring legacy cannot be understated – but that doesn’t change the fact that is also kind of bland. For a band supposedly so rebellious and non-conformist, it does sound quite conformist. This record is loaded. Not so much with creativity or original ideas, per se – but with a history of infamy few records in metal can wish to match, or surpass. Financed by funds generated from Øystein Aarseth’s record store Helvete in Oslo the record was beset by a number of logistical problems. Jørn Stubberud (Necrobutcher, bass guitar) opted out after the suicide of original vocalist Per Yngve Øhlin (Dead) and Kristian Vikernes (Count Grishnackh of one-man studio project Burzum) laid down bass guitar tracks in his absence. 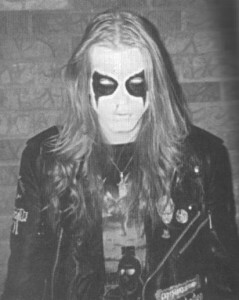 That the same Vikernes who would end up murdering Øystein Aarseth (Euronymous) over supposed “contractual disputes” is a story had has since eclipsed the very band and much of their music at its center. Next to the late Øystein Aarseth, there are contributions from Snorre Ruch (of Thorns) who would commit church arson not much later. The vocals were provided by Hungarian transplant Attila Csihar from the band Tormentor. Sitting behind the drums is Jan-Axel Blomberg (Hellhammer), the de facto bandleader, but not an actual original member in any shape or form. Notorious in its supposed condemnation of standards and practices of the nascent death metal scene, Mayhem made a name for itself with the “anti-Scott Burns” plastering all over its “Deathcrush” debut EP. 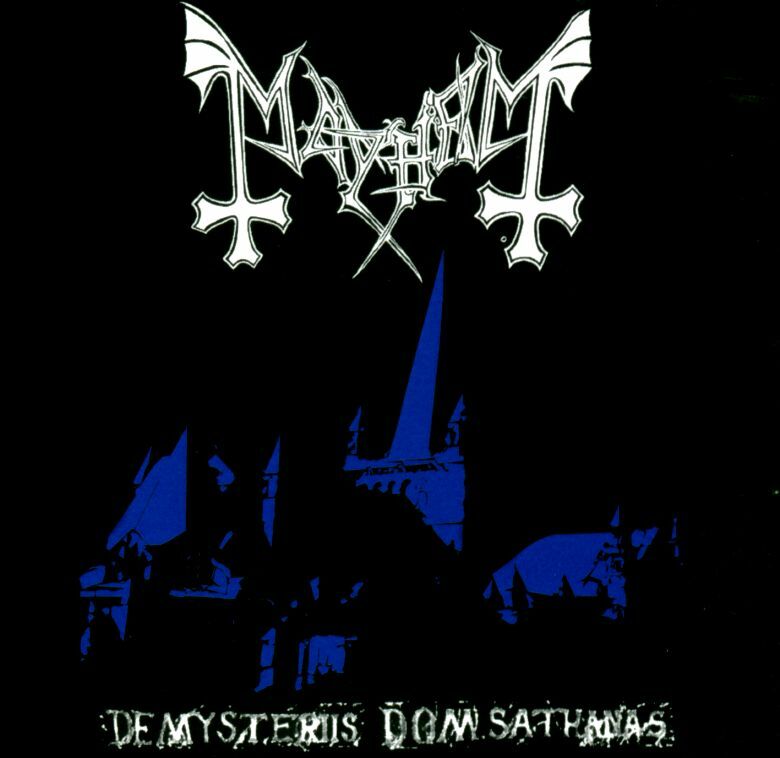 It is then surprising that the first Mayhem full length “De Mysteriis Dom Sathanas”, recorded at the Grieghallen Studios, sounds nearly identical to the Morrisound Studios and Tampa death metal sound. Wasn’t this supposed to be the antithesis to that very thing? Given the band’s infamous reputation it is perhaps not strange that no label in the right mind dared to touch them, and thusly “De Mysteriis Dom Sathanas” was released through the band’s own label imprint, Deathlike Silence. That is not to say that it isn’t great, because “De Mysteriis Dom Sathanas” is probably the one of best records in this genre. It’s just that, well, it sounds more death metal in terms of playing, construction and overall aesthetic when it comes right to it. Only in retrospect would this be considered black metal, in actuality it is only minimally so. Exactly how much black metal is “De Mysteriis Dom Sathanas” then? Well, to be entirely honest, not a whole lot. In fact, you’d be hardpressed to call this black metal at all, because outside of the musicians involved, there isn’t a whole lot that actually qualifies as such. This sounds a lot more like a better produced, better developed take on the Old Funeral death metal sound more than anything else. What is black metal about this album? Attila’s strange croaks certainly fit the tag, and some of the scales and riffing is darker, suicidal and more malevolent sounding than a lot of the death metal released at the same period of time. The abstract evil lyrics help too, but that’s about it. In terms of music this is death metal through and through. In the album’s second half the black metal stylings appear to prevail, especially with Blomberg delivering an insane amount of blasting, a testament to his stamina and expertise as a drummer – while the riffs get more stripped down, barbaric and cold sounding. While each track is a classic in its own way, it’s post-‘Pagan Fears’ that the record truly reveals its enduring strength. Where this record differs from most standard death metal is the riff set, which already is bordering on early black metal territory – and the whole thing sounds downbeat, sodden and nihilistic on all fronts. The wailing solo in ‘The Freezing Moon’ carries so much depraved emotion, that combined with Csihar’s schizophrenic vocals resonates with everybody on both spectrums of the genre, death – and black metal alike. There’s also the notion of just how bass-heavy and bass-centric this record really is. This could easily be mirrored with Mortification’s “Scrolls Of the Megilloth” or Kataklysm’s “Sorcery” in terms of thundering low-end heaviness. The opening section of ‘Pagan Fears’ is almost rock ‘n roll-ish in its playfulness, and it’s the type of thing you’d expect in US or European death metal, not in an early progenitor of Scandinavian black metal (even though, it is excuseable here as both genres share similar roots). Attila Csihar stays as close as humanly possible to the vocal patterns laid out by Yngve Ohlin on the “Live in Leipzig” release, and on other tracks he mimics his style to utter perfection. The early black metal stylings truly come to the fore in the slow building dirge that is ‘Life Eternal’. If there’s one thing, it is here that black metal started its decade-long fixation with Latin song – and album titles. The album title roughly translates to ‘Of Lord Satan’s Secret Rites’. This tradition of using Latin would later be held up by the likes of Abruptum, post-David Parland Dark Funeral, latter-day Gorgoroth and a number of underground hordes. What also would come to characterize the genre are the absolutely atrocious band logos. Thankfully, Mayhem here is tasteful with that. The logo looks sufficiently evil, but it remains identifiable and instantly recognizable. In all “De Mysteriis Dom Sathanas” is a record legendary for the events surrounding it than the actual music. Once again, the album is very strong and exceptionally wellwritten for what it aims to do. Only in retrospect would it be considered black metal, as from a technical – and construction point of view, it obviously has far more commonalities with death metal. The instrumental part of the album was recorded at Grieghallen Studios during late 1992 with Aarseth, Blomberg, and Vikernes laying down their respective parts with producer Eirik ‘Pytten’ Hundvin. The vocals were recorded in a week’s time in 1993 as Csihar flew in from Hungary for the sessions. The album itself wasn’t released until 1994 upon the aftermath’s of Aarseth’s slaying by Vikernes, and the latter’s incarceration. Half of the album was composed by former bass guitarist Stubberud with input from Øhlin, Ruch and Aarseth. The cover depicts the east side of the Nidaros Cathedral in Trondheim, Norway, which the band had devised to blow up to coincide with the album’s release. Those events didn’t quite transpire the way the band had envisioned, and ended up tearing the band apart in the process. Since controversy is the best fuel it wouldn’t take long for Mayhem to resurface in a reconfigured form in the aftermath. If it weren’t for the infamous happenings surrounding this release it would have probably been forgotten and written off as a commendable footnote in the history of the genre. It is rather telling that Mayhem only opted to settle into a more blast-oriented direction after other bands (Dark Funeral and Marduk, to name the most obvious) had paved the way. As supposed innovators of the genre Mayhem certainly has no problem imitating which sound is popular in the day. They did so on the “Deathcrush” EP, continued the trend here, and likewise with the reunion “Wolfs Lair Abyss” EP. Interestingly to consider is that Mayhem only integrated electronic and industrial sounds after fellow Norwegians Mysticum laid out the pioneering groundwork with “In the Streams Of Inferno”. The more impressionable often call Mayhem innovators, which they clearly are not. That they are more marketable because of their history of infamy should be obvious. As far as talent and musical merit goes this band’s importance is debateable. Its legend had long since eclipsed its actual musical accomplishments (that are precious few to begin with). Each member masters its instrument of choice to a considerable degree, and the ghoulish vocals are a wonder to behold – yet the band is barely more than the sum of its parts. “De Mysteriis Dom Sathanas” certainly manages to captures the desolate, barren essence of the black metal genre despite its overall European death metal formatting.